Details at the end of this post on how to enter to win an ebook copy of The Deepest Grave and a really cool sword letter opener from Jeri. You will also find a link to purchase the book from Amazon, and an indie bookstore where a portion of the sale goes to help support KRL, and a link to Jeri’s episode of our podcast. The Deepest Grave is the latest Crispin Guest medieval noir mystery written by Jeri Westerson. Crispin is a former knight who was accused of treason and stripped of everything. To survive, he has turned to his considerable deductive skills and basically become the first private detective, though what they call him is the “Tracker.” Crispin has managed to survive using these skills, providing a meager life for himself and his apprentice Jack Tucker, a former thief. This latest book takes a bit of a time jump from the last one, and some significant changes have happened during that time. You find Crispin in the best situation that he has been in since the series started. He has a better home, and is building a sort of family. His apprentice, Jack Tucker, is now married and he and his wife Isabella are expecting their first child. Jack has grown into a fine young man, and is now of even more help to Crispin, and his wife cooks for them and keeps the home. There is a sort of peace in his life that Crispin hasn’t experienced for some time. And he too has grown and changed considerably because of it. I always enjoy a Crispin Guest mystery, but this one may be my favorite one so far! Not only is it filled with medieval adventure and two well plotted mysteries filled with many twists and turns, but it’s also really nice seeing how much the characters have grown and changed. I also really enjoyed the “walking dead” aspect of the story, and was completely surprised when the villain was revealed! The history of the time period is always interesting as well. My one regret is that one of my favorite side characters, the cross dressing John Rykener, wasn’t in this story, but I hope we do see him again in the future. If you enjoy a wonderfully constructed mystery, interesting and well developed characters, and a unique and fascinating setting, don’t miss The Deepest Grave! You can also hear a snippet of the book come to life in a recent Mysteryrat’s Maze podcast episode, which features the first chapter. 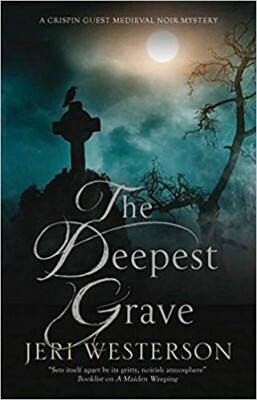 To enter to win an ebook copy of The Deepest Grave (be aware that for this one you must join NetGalley to get your copy-but NetGalley doesn’t cost anything) and the fun sword letter opener, simply email KRL at krlcontests@gmail[dot]com by replacing the [dot] with a period, and with the subject line “deepest grave,” or comment on this article. A winner will be chosen September 15, 2018. U.S. residents only. If entering via comment please include your email address. You can read our privacy statement here if you like.